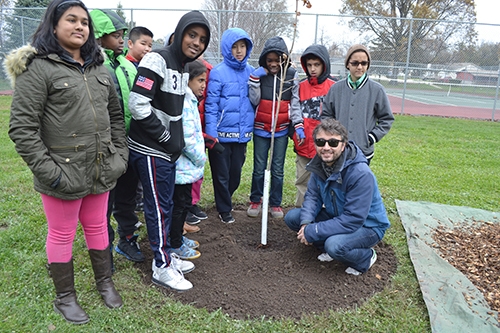 Mattia Gazzola (bottom right), along with students from King School, next to the Swamp White Oak he planted in Carle Park as part of his Paper2Tree initiative. While appreciating the beauty of nature on his 20-minute jaunt from his home in west Urbana to campus every day, Mechanical Science & Engineering (MechSE) Assistant Professor Mattia Gazzola decided that just gazing at trees and being refreshed in his soul wasn’t enough. He felt he needed to counteract one of the negative effects of his job—publishing papers that, over the life of his career would, in all probability, take the lives of a number of trees. So he came up with Paper2Tree, a practical way for those in academia to not just take, but to give back by planting real trees to replace the ones destroyed while practicing their profession and working with schools to expose more youngsters to STEM. 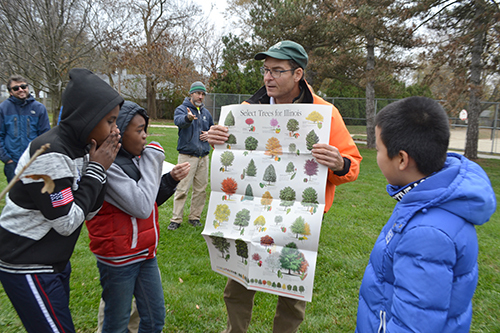 Mike Brunk, the Urbana City Arborist, shows King fifth graders the "Under the Canopy" publication he and some colleagues from several City of Urbana partners developed about Illinois trees. So Gazzola did his homework. He broached the idea with MechSE’s Educational Outreach Coordinator, Joe Muskin, and Julia Stackler, the Assistant Director of Communications in MechSE’s Media Office. Both liked the idea. So they approached the head of the department, who also liked it. Finally, they pitched the idea to the City of Champaign, the City of Urbana, plus the Champaign and Urbana park districts, who liked the idea too. So the Paper2Tree program germinated, sprouted, and began to push up through the ground. 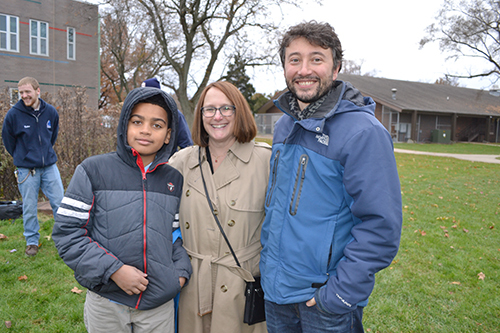 A BTW fourth grader poses with Champaign Mayor Deborah Feinen (center) and Professor Mattia Gazzola (right). 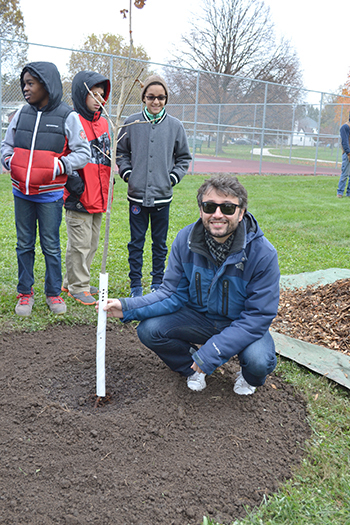 One nice thing about Gazzola’s notion— compensating for paper used by planting a tree—was that he didn’t have to reinvent the wheel when it came to planting the trees…both local park districts have tree-planting programs in place. There is a fee (around $200–$300) to pay for the tree itself and to pay the park district for the manpower to not only plant the tree, but to care for it for the next 10 years. Plus, if it dies during the 10-year period, they’ll replace it. “We just needed to use what they do already and then channel it in a different direction,” Gazzola explains. Professor Mattia Gazzola (front center) with the fledgling Swamp White Oak he helped to plant. 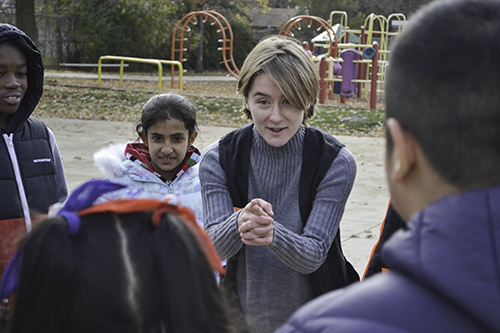 With the first two aspects of his three-step approach taken care of (writing a research paper then planting a tree), Gazzola then concentrated on the third part: fostering research-related outreach to local schools. So he contacted the Champaign and the Urbana school districts who are partnering with Paper2Tree in order to facilitate outreach events connected to the papers. Above: A group of King fifth graders cheer on a classmate who succesfully completed Assistant Professor Chenhui Shao's cookie puzzle activity. 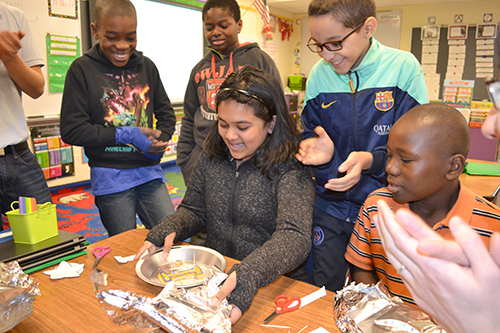 Below: BTW fourth graders show off their completed gliders. Gazzola also believes this third step—fostering outreach to local schools—provides the rationale for getting faculty who might be outreach-minded but not necessarily be environmentally conscientious enough to shell out $300 to be involved in Paper2Tree. 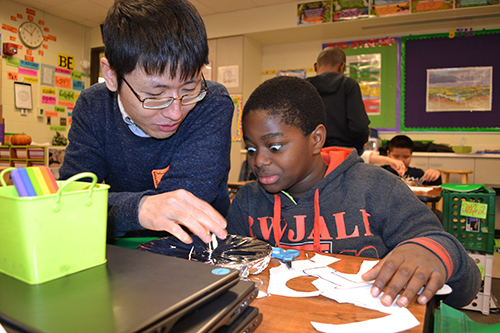 Above and below: MechSE Assistant Professor Chenhui Shao interacts with a class of King fifth graders. So to announce the program and to demonstrate how outreach activities related to research papers could tie in to the program, during the Paper2Tree kickoff event, Gazzola and several MechSE colleagues provided outreach activities in local schools. For instance, at Shalonda Carr's fifth grade class at Urbana's Martin Luther King Jr. 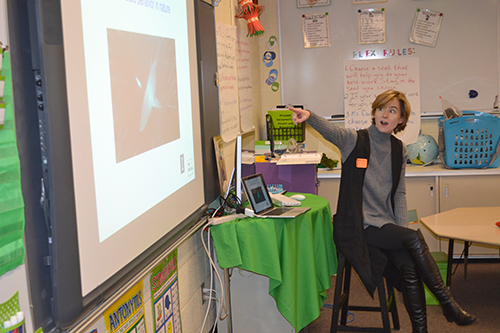 Elementary School, Assistant Professor Amy LaViers led several activities related to her research, robotic movement and flocking. 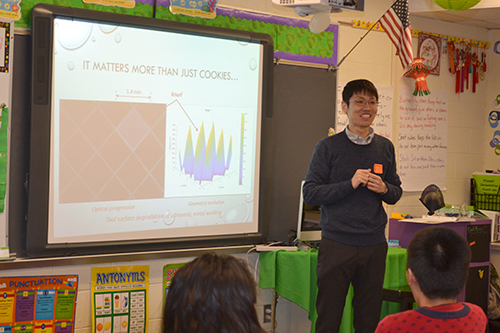 Then Assistant Professor Chenhui Shao led Carr's students in a cookie puzzle activity. And to add to the fun, after the activity, they got to eat the cookies. Then, to top it all off, the students got to help plant Gazzola’s swamp oak tree. The afternoon’s festivities took place at Champaign’s Booker T. Washington STEM Academy courtesy of BTW's STEM Specialist Loren Johnson. 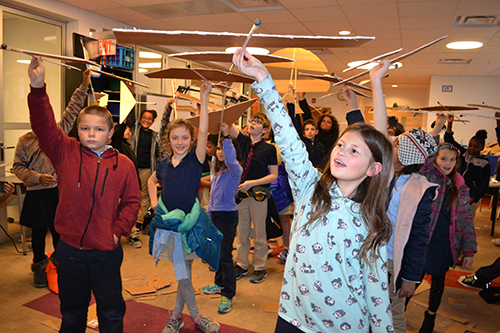 BTW fourth graders were exposed to Gazzola’s research during a robotic fish activity, and Assistant Professor Aimy Wissa and some of her students led fourth graders in building bio-inspired gliders which actually flew…some quite well. To cap off the afternoon activities, Shao’s tree was planted as Champaign’s mayor, Deborah Feinen, and other dignitaries looked on. But the Paper2Tree outreach component has another, even deeper layer. Gazzola is adding a new section to the website: an activity module where information related to a given outreach will be made available. 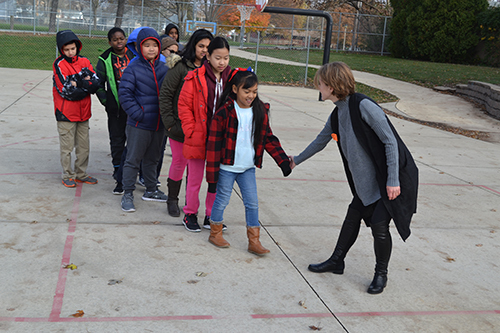 Above and below: MechSE Assistant Professor Amy LaViers leads King fifth graders through several activities related to her research, including robotic movement and flocking. But the professors don’t just give; they get something out of it too. Sure, there’s some hoopla celebrating their publication, plus some free publicity. “In my mind, if you publish a nice paper, it's going to be at an outreach event; it's gonna be advertised on our website,” Gazzola explains. “So my idea is to have little sections for each activity which you see the person that sponsors it and a summary of their life and activities.” But even more importantly, publishing professors get the satisfaction of knowing that, in addition to adding some extra oxygen to the atmosphere and some extra shade to someone’s path, they just might have inspired some youngster to follow in their footsteps. 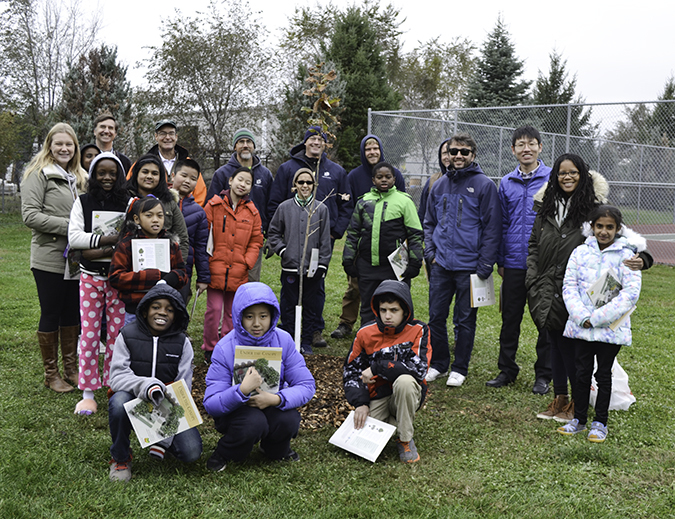 Some of the many folks who helped plant the Swamp White Oak next to King School, including Shalonda Carr and her fifth graders, Professors Gazzola and Shao, Joe Muskin and Julia Stackler, and several Urbana Park District personnel.